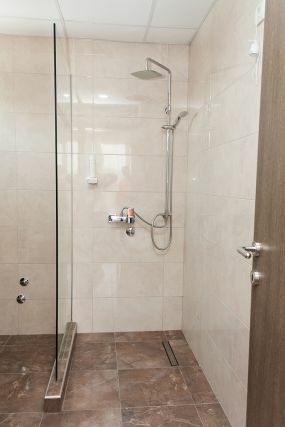 Every detail has been considered for the accommodation of 6 people. it is very comfortable and economical option. Breakfast Included. All the details are thought out for the 6 persons in our room which is very comfortable and economical and it is a very good choice for our guests who are giving more importance to their comfortable. 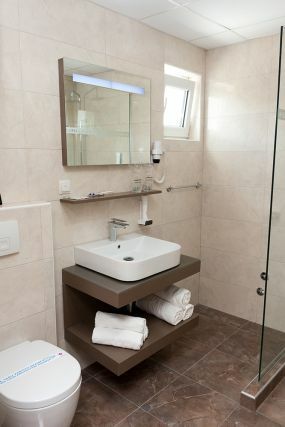 Free wi-fi internet, refrigerator, shower, wc, refridgerator, shampoo, towel, slippers, safe and carpet floor with balcony, possibility of watching the turkish channels, is a standard for all our guests. Breakfast Included (06:30-10:00). The check-in time starts at 14:00. Reservations must be canceled 24 hours prior to arrival to avoid being charged a penalty. A minimum penalty of one night's room and tax will be charged if a reservation is canceled after the specified cancellation time. Prepaid reservations and deposits are nonrefundable and cannot be canceled without forfeiting the entire amount of the stay or deposit unless specified otherwise. Exceptions may apply during holiday, special events and conventions. Please note that a change in length of stay or dates (based upon availability) of your reservation may result in a rate change and/or may not be available based on length-of-stay restrictions. Bosphorus has two payment policies depending on which rate you choose to book. All reservations except for prepaid bookings adhere to the Global Guarantee Policy. All reservations must be guaranteed with a valid major credit card at the time of booking. We reserve the right to cancel any reservation that is not booked with a valid major credit card. Guest must present a valid major credit card in his or her name upon arrival at the hotel, at which time a credit card authorization will be processed to cover all charges. A sufficient amount of credit must be available to cover all room charges, taxes and incidental charges. Presenting a debit card upon arrival will result in a hold (temporary charge) on your account for the amount authorized. Cash payment will be accepted upon checkout, at which time the credit/debit card authorization will be released. Once an authorization has been released, the credit/debit card issuing bank will determine when your funds can be made available. Cash payment will be accepted upon checkout, at which time the credit/debit card authorization will be released. Once an authorization has been released, the credit/debit card issuing bank will determine when your funds can be made available. The credit/debit card provided for this reservation will be charged for the full amount of the stay plus tax, and this charge is nonrefundable. Please ensure that you have sufficient credit/funds available to cover the charges for your stay. We will be unable to honor any reservation that is made with an invalid credit/debit card or a credit/debit card with insufficient credit/funds available. Guest must present a valid major credit card in his or her name upon arrival at the hotel as a security deposit and to cover incidental charges. A credit card authorization will be processed and a sufficient amount of credit must be available to cover the amount authorized. Presenting a debit card upon arrival will result in a hold (temporary charge) on your account for the amount authorized. Please contact the hotel to determine the amount of the authorization required. Bosphorus welcomes group business, but due to the smaller size of our hotels, we ask that you contact the hotel directly for group reservations. This way, we can do our best to accommodate your group needs. 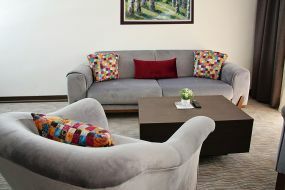 A reservation for 10 or more rooms, whether booked by one reservation or multiple reservations, is considered a group. Groups must contact the hotel Sales Office for reservations in order to receive special services and group rates. Group services are not available if the reservations are booked electronically or via the internet and may be canceled upon the hotel's discretion. PARTIES For the comfort of all of our guests, we do not allow parties or excessive noise in or around guest rooms and suites. PETS Bosphorus is dog-friendly, accepting dogs on request only. There is a nonrefundable cleaning deposit of $150 per stay excluding food. Dogs only up to 25 lbs. maximum. Service animals are permitted based on state law. While entering payment card data, confdental data is transferred by way of public network in encrypted form. The safety of data at the tme of purchase is guaranteed by the card acquirer – Societe Generale Beograd – and the entre collecton process is carried out on the bank website. At no tme shall the data about the payment card be avaailable in our system. If you decide to make an online reservation at bosphorushotel.rs, you will be linked to a payment gateway provided by SOCIETE GENERALE SERBIE. While it appears to be part of our website, the booking engine is actually provided by a payment gateway of SOCIETE GENERALE SERBIE and is governed by its privacy practices. We understand that security remains a primary concern of online consumers and have chosen our booking engine vendor carefully. We take the utmost care to ensure that the personal information we obtain from you is used only for the purposes we describe. You may wish to submit a message or question to Bosphorus Hotel using our online Contact Form or to subscribe to our email list using our Join feature. In response, we may ask for information, such as your name, email and ZIP code. In the event you opt to provide us with this information, we will only use it for the purpose specified. Personal information collected during the reservation process may be used to communicate with you about your stay(s) at Bosphorus Hotel. In addition to the potential need to communicate with you about your stay(s) at Bosphorus Hotel, we always seek to improve our online booking, marketing and other services and may, therefore, collect and analyze information from and/or about your computer and about your visits to and use of this website (including your IP address, geographical location, browser type and version, operating system type and version, referral source, length of visit, page views, website navigation paths and service usage) to that end. If you choose to subscribe to Bosphorus's Contact List using the Join feature or to follow the Bosphorus's blog, please know that all communications will provide an opt-out button to allow you to choose not to participate in future online marketing. In deciding whether or not to join such lists, please note that they are only used for Bosphorus Hotel purposes or in joint promotions with Bosphorus Hotel partners. We do not sell, rent or share any of your personal information on such lists with any other party, including any third-party joint promoters, nor use it for unapproved commercial purposes. You may request to be removed from our lists at any time. All emails distributed to our lists will contain easy, online access to unsubscribe. Throughout our website, we provide links to other websites that we believe may offer you helpful information or services. Those sites, however, have independent privacy policies. Therefore, we are not responsible for the privacy policies or the actions of any third parties, including without limitation, any website owners whose sites may be reached through our website, nor can we control the activities of those websites. We urge you to contact the relevant parties controlling these sites or accessing their online policies for the relevant information about their data collection practices before submitting any personal information. These terms and conditions apply to all bookings (reservations) made via BOSPHORUS’s website. All booking agreements are entered into with BOSPHORUS HOTEL / VAT no 10130839, Registry no 17260588, Primary activity 5510, Accounts 205-18977-96;355-1038516-26;160-177289-23. / Beograd-Niş e-75 Autobahn Aleksinac/Serbia. All bookings must be paid for in advance when the reservation is made. Payment must be made online via Visa, Visa Electron, MasterCard or Maestro. Other credit cards are not accepted. There are no payment fees. All payments will be made in Serbian currency – dinar (RSD). The amount your credit card account will be charged for is obtained by converting the price in shown currency into Serbian dinar according to the current exchange rate of the Serbian National Bank. When charging your credit card, the same amount is converted into your local currency according to the exchange rate of credit card associations/your issuing bank. As a result of this conversion there is a possibility of a slight difference from the original price stated in our website and your credit card bank statement. Thank you for your understanding. In cases of force majeure or other extraordinary circumstances beyond BOSPHORUS’s control – including fire, water damage, strike/lockout, breakdown in telephony/data connections or other technical failures – BOSPHORUS is entitled to cancel bookings without prior warning and at no liability. BOSPHORUS’s liability for compensation cannot, regardless of cause, exceed the total price of the booking, and any compensation will not cover indirect losses, such as loss of profits, transport and travel expenses. Similarly, BOSPHORUS is not liable for expenses relating to alternative accommodation. 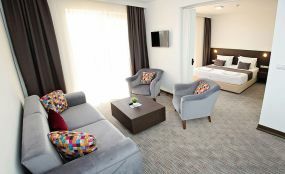 BOSPHORUS is not liable for lost or stolen property or luggage in the room or at the hotel in general, including in connection with the use of luggage rooms and/or luggage boxes. It is not possible to reserve a parking space. Reserving a parking space in connection with a booking is considered a request that BOSPHORUS will do its best to fulfil. Parking is at the owner of the vehicle’s own account and risk. BOSPHORUS is not liable for vandalism or theft of or from parked vehicles. Parking must be paid for upon arrival, after which the customer will be issued a parking permit which must be VISIBLE in the windscreen of the vehicle. Parking without a parking permit is subject to a fine (currently DKK 650). Rooms are cleaned on a daily basis between 8 am and 3 pm. 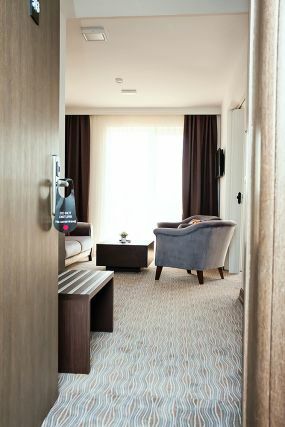 If it is not possible to clean the room due to luggage or other objects belonging to the guest, BOSPHORUS is entitled to refrain from cleaning the room on the day in question. Towels are changed on a daily basis as needed. For stays of longer than 5 days, bed linen is changed as needed. BOSPHORUS is entitled to use the email address used to make the booking to issue e-newsletters and promotional material. BOSPHORUS will only promote its own products. The customer may at any time request to be removed from the mailing list and to no longer receive newsletters and promotional material by email. Requests for removal from the mailing list can be sent by email to info@bosphorushotel.rs; please state the email address to be deleted from the mailing list. Removal can also take place via the link found at the bottom of all newsletters and promotional material. You will find a Istanbul restaurant at the Bosphorus facilities and the tastes that will be presented to you will belong to the Turkish culture. The hotel also offers a very modern banqueting hall Ela with 300 seats for any organization. You Bank Accounts Are Listed Below For Your Booking Payments. Please Don't Forget To Inform Us About Your Payment After It has Been Completed. You Can Contact us 7/24 From Lıve Chat Stays At The Right Bottom Side Of Our Website. Bosphorus Hotel aims to continuously improve the services provided to its guests. Effective complaints management is fundamental to the provision of quality services and provides a platform for obtaining feedback from its guests with the purpose of resolving disputes and reforming policies and procedures. Your complaints will be investigated in depth, will be handled in an efficient and effective manner and you will be treated courteously. We will be fair both to you and any employee for whom a complaint may refer to. We will not charge you for making a complaint. We will always observe privacy and confidentiality of any personal data. Any individual involved in the complaint or responsible for the management of the complaint will not participate in the investigation process should there be conflict of interest. Our employees will undergo continuous training on the Complaint Management Policy and will have direct access to related documentation in order to facilitate the effective handling of complaints. Our Board of Directors, management and employees acknowledge your right to file a complaint and are committed to the efficient and fair resolution of complaints or problems that may arise from the services we provide. The complaints management system included in this Policy and internal procedures will be reviewed periodically (at least annually), aiming to enhance the transparency, efficiency and the greatest possible satisfaction of Bosphorus Hotel guests. Our Complaints Management Policy will always be available on our website: www.bosphorushotel.rs. 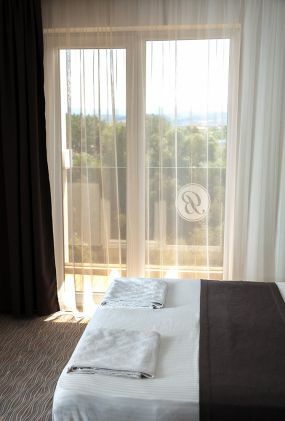 ​Any complaint can be submitted by a guest of the hotel. Should you worry about any aspect of the services we offer, your first point of contact should be the hotel’s reception. Our aim is to promptly resolve any possible issue you might have, prior to your departure. If you find it necessary to pursue the matter further, you should submit a formal complaint letter (by electronic mail) addressed to info@bosphorushotel.rs to investigate the matter independently. – Acknowledgement of your complaint within 3 working days of receipt. – Your complaint will be addressed within 15 working days. A relevant response will be sent immediately. – On rare occasions where more time is required for the proper and detailed investigation of your complaint, an extension period will be requested in writing. In our letter, besides any additional information that we may request, we will inform you of our actions taken so far and any further actions required for the completion of the investigation. – Our aim is to ensure that you receive our final response within 10 working days from the time of the extension notification. Should you wish to request an update at any stage of the complaint investigation, you can do so by contacting the hotel. Try to solve the new Formula Cube! It works exactly like a Rubik's Cube but it is only $2, from China. Learn to solve it with the tutorial on rubiksplace.com or use the solver to calculate the solution in a few steps. I Aggree Terms And Contitions on Website. Dear , YOUR RESERVATION HAS BEEN COMPLETED SUCCESSFULLY for Suit Room For 6 Person ( ). Your Reservation Number is And We Also Sent This Details To You E-Mail Address. SECURE PAYMENT All Your Informations Are in Secure With SSL Certificate. FOLLOW US ON SOCIAL MEDIA Follow Us On Social To See Our Latest News.